In the sports world, sweaty gear can double as a badge of honor. However, it can also serve as a gateway for harmful pathogens – making athletes susceptible to harmful bacteria, viruses and fungal infections. That’s the last thing customers want to think about when they’re looking for quality used sporting goods and equipment. 2nd Time Sports takes the worry out of this experience by thoroughly sanitizing each and every piece of gear in our inventory. 2nd Time Sports is proud to feature a Sports-O-Zone machine at each of our locations. This technology utilizes ozone to scope out and eliminate bacteria, viruses, fungus and molds. Known as “activated oxygen,” ozone is a natural gas made up of three oxygen atoms versus the usual two. This makes it the second most powerful oxidant in the world – as it reacts with bacteria upon contact to destroy the cellular walls that sustain them. This makes ozone an effective disinfectant for both air and water. Offering fresh-smelling, germ-free equipment is just one of the ways 2nd Time Sports creates a safer, healthier sporting experience for all. We understand how tough it can be to truly sanitize and deodorize sporting gear, especially if you’re a busy parent. No matter how many times you toss a piece of equipment into the washer or spray it with disinfectant, you can never be sure you’re killing 100% of the germs threatening your young athlete’s health. And, what about those larger pieces that leave you stumped when it comes to proper cleaning procedures? Luckily, there’s an alternative to soaping up and hosing down those bulky football pads. 2nd Time Sports gladly offers equipment sanitization services for customers whose gear is overdue for a heavy-duty cleaning. 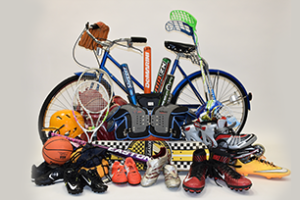 Allow us to take your sporting equipment through our special ozonation process and wipe out harmful bacteria. Your immune system (and your nose!) will thank you. Request more information to learn about how our special Sports-O-Zone technology can help you with your equipment sanitization needs.